The true impetus for my interest in native plants, however, is a bit more personal. It started back in the summer of 1987 when, out of nowhere, mysterious “paper cuts” appeared on the knuckle of my thumb. I did not cut my fingers in any way, but my skin would just gash open and bleed slowly for no reason, leaving me painful and itchy at the same time. As the condition developed, I could have five to ten of these cuts over my five fingers, which took two to three weeks to heal. A month or two later, another episode of “paper cuts” outbreak would repeat all over again. Over the next ten years, I saw several doctors, but they could only tell that it was neither infection nor allergy, and, since the hydrocortisone cream they prescribed did not help, the only thing I could do was wrap band-aids around the wounds. It was not until 1998 that I found a Chinese herbalist who could make a cream that, when applied, closed the wounds beautifully within two days. Unfortunately, the cream lost its healing power after two weeks, so I had to see the herbalist for a fresh batch every time a new outbreak occurred, which was not very practical. In 2006, my mother was offered a pair of tickets to the Green Festival in San Francisco, where her friend was a vendor. As the tickets sold for $15 each, I gladly accepted when my mother gave them to me and told me to find out for her how people were making money under the banner of protecting the environment. The exhibit hall was packed with vendors, one of whom was selling herbal first-aid kits for $40. “Forty bucks for a first-aid kit! Isn’t that expensive?” I exclaimed quietly to my wife. There were three bottles of tinctures (alcohol extracts) and four vials of salves (similar to butter in texture) in the kit, but what caught my attention was a little card that listed many different conditions and the corresponding tincture or salve to treat each one. Mostly out of curiosity, I showed the vendor my “paper cuts” and asked her what remedy she would recommend. After a moment of thought, she told me to try the yarrow salve. I was reluctant to spend $40 on an unproven remedy for a condition that doctors could not solve, but on second thought, the first-aid kit was such a great business idea that I could not resist bringing it back to show my mom. So I bought the kit. That night, my wife and I, hoping $40 would at least buy us a good laugh, jokingly applied the yarrow salve on parts of our skin that could use some help. But the real funny thing was that, next morning, the itch and the pain on my fingers had stopped. A day later, most of the “paper cuts” had closed and healed. I had actually found a long-lasting solution for the skin condition that had troubled me for twenty years! Naturally, my mother was ecstatic to hear the news. She was so happy that she decided to learn to grow yarrow in her garden and make yarrow salve for me, which turned out to be not too difficult. All she had to do was to soak the plants in olive oil for a few months, and then mix the oil with a specific proportion of melted beeswax, which solidified on cooling into a butter-like salve. I became fascinated with yarrow and, after a few Internet searches, learned about its reputation as a blood-stopping, wound-healing herb—hence its genus name Achillea, supposedly to commemorate the famous Greek hero Achilles, who used yarrow to heal the wounds of his soldiers during the Trojan War. 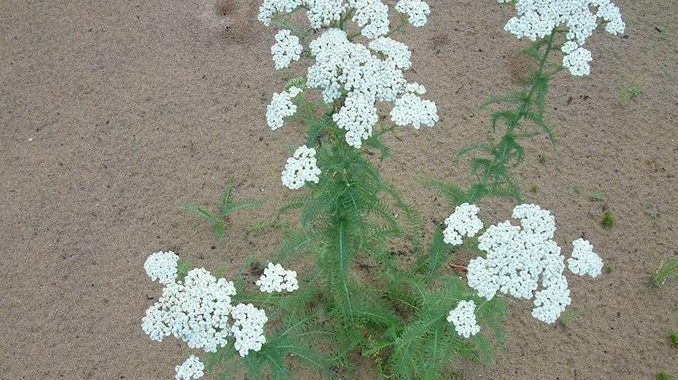 If yarrow was capable of healing horrendous wounds inflicted by spears and swords, no wonder it had no trouble healing the “paper cuts” on my fingers. But this is only one way in which yarrow has improved my life. Beyond yarrow, it was only natural for me to then become fascinated with the other six plants used in the herbal first-aid kits—plantain, arnica, St. John’s wort, elderberry, California poppy, and Oregon grape. What do they look like? Where can I find them? What possibilities do they hold? Furthermore, what other magical plants are out there? As I spent more time reading field guides to medicinal plants, it soon became clear to me that almost every plant in California has some sort of medicinal use. It is only a matter of whether we have records of such precious knowledge from the indigenous people who utilized the plants but who, unfortunately, had likely long vanished. Thus it made sense to me to simply go ahead to learn all the plants I could possibly find in the wild. It was under this circumstance, exactly one year ago, that I discovered CNPS and began joining its many field trips. Unlike the healing of my “paper cuts,” the satisfaction that comes with knowing the plants which surround me is intangible, but it is equally fulfilling and rewarding to my natural spirit. Who knows what someday I may be able to do with the knowledge about California native plants? But whatever awaits me in the future, I owe much to this wonderful plant called yarrow and to the wonderful people at CNPS who share their knowledge with me. It is true and certainly no exaggeration that “all I know about plants I learned from CNPS.